Tractors in India are out of reach for the majority of farmers. The cheapest tractor costs Rs 1.8 lakh, almost as much as a new car. But while a car is a luxury, a tractor is not: it's becoming an imperative as the demand for food grains increases. Barely two per cent of the 115 million farmers own a tractor, according to the 1995-1996 agricultural census. Yet, tractors cultivate almost one third of the country's arable land, states N S L Srivastava, agriculture engineer and joint director of Sardar Patel Renewable Energy Research Institute in Vidyanagar, Gujarat. Since the two per cent farmers possessing tractors do not own one third of the country's arable land, how do we explain Srivastava's claim? We can do this in the light of two facts. First, most farmers possessing tractors are rich and own large land holdings. Second, tractors are available on hire. The hiring rates vary from region to region and also with the nature of work. 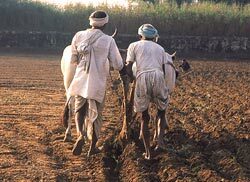 For instance, the rate for ploughing is Rs 200-250 per hour or Rs 2,000-2,500 per hectare (ha). But small farmers are unable to reap such benefits. For them, a low-priced, small tractor of 15-24 horsepower (hp) would be ideal. This need was recognised as early as 1970 when the National Commission on Agriculture (NCA) was set up. After a five-year study, NCA submitted a long report in 1976, which also recommended the type and quantity of tractors India should have by 2000: 2.08 million tractors and power tillers (a farm machine, with two wheels, to till the soil) below 15 hp, 0.12 million medium tractors of 35 hp and 80,000 65 hp tractors, which taken together would total 2.28 million. This policy argued that 2.08 million tractors and power tillers below 15 hp were needed for small and medium farmers. Besides, they are considered more suitable for paddy cultivation -- the country's dominant food grain crop -- than medium (25-40 hp) and heavy (above 40 hp) tractors. At the turn of the century, India had about 2.67 million tractors, which was more than NCA's projections. But categorywise, the numbers went awry: about 1.47 million tractors were in the 31-40 hp range, 0.65 million were of 40 hp and above and 0.68 million were of 30 hp and less. Only a part of the 0.68 million tractors below 30 hp would constitute small tractors for which NCA had projected a figure of over 2 million. Such a large gap was shocking and reveals the perfunctory approach of the government to small farmers. The quantity of power tillers sold was merely 70,000. The agricultural engineering community, in general, and the Indian tractor industry, in particular, were responsible for throwing NCA's calculations off balance. Instead of a small tractor, they came up with medium to heavy tractors, which benefited only the large farmers. As a result, tractors are concentrated in a few states, which were the main beneficiaries of the Green Revolution such as Punjab, Haryana and parts of Uttar Pradesh (see table: Some benefit). Big tractors, like big cars, have become status symbols. This is partly why the tiny state of Punjab has maximum tractors (see box: Tractor crazy). On the other hand, the crisis of the farmers' traditional tiller-the draught animals -- is also growing. Even though most farmers still rely on draught animals, their importance has been undermined by tractors, which deliver more power and so can work faster. According to the NCA report, a man can provide a power equivalent of 0.07 hp, a woman 0.05 hp, a bullock/buffalo 0.40 hp, a camel 1 hp and a tractor at least 14 hp. This is significant because more farm power availability usually implies higher productivity. In 1951, the farm power available was just 0.25 kilowatt per ha (kW/ha), of which about 97 per cent came from draught animals. This has now gone up by almost 6 times to 1.40 kW/ha and the corresponding increase in food grain production has been four fold. The power came largely from tractors and farming implements, and also from electric and diesel motors used to pump water for irrigation. Tractors also work best when the time for agricultural work is limited. "About 65 per cent of our cultivable area consists of dry farming or rainfed farming. If we are unable to do seedbed preparation and sowing in a timely manner, given the receding soil moisture, yields are less," says Srivastava. However, about 70 per cent farmers still use draught animals. So it is logical to invest in increasing the efficiency of draught animals and the associated equipment such as yokes. But this demands more than anything else, that policy and practices begin to focus on the needs of the small farmer. Tractors came to India in the 1960s, imported from the US and European countries, mainly the erstwhile Soviet Union. But these countries had large land holdings; most tractors made there were of medium to high horsepower. In a country where landholdings were not so large, such tractors came to be replicated, unthinkingly. India also imported tractor kits that could be assembled. In 1961-1962, about 880 such tractors were assembled from kits purchased from British and German firms. Imports stopped in 1977 (see box: Tracks through time). But industry's fascination -- or should we call it a case of new winw in old bolttles? -- with foreign models continued. It preferred to rely on foreign design and engines, and making medium and high horsepower tractors. More power meant higher cost. However, this aspect of tractor development did not deter manufacturers. The rich farmer was targeted. What helped was government had no policy to veer them towards small and medium farmers. Therewas just one fully indigenous tractor: Swaraj, manufactured by Punjab Tractors Limited (PTL). Developed in the late 1960s as a 20 hp tractor by a laboratory under the Council of Scientific and Industrial Research, official disinterest put piad to the effort: for instance, when public sector Hindustan Machine Tools (HMT) branched into making tractors, it preferred a Czech design; who wishes to risk a deliberately untested technology? Finally, the Punjab State Industrial Development Corporation (PSIDC) was persuaded to manufacture it in 1974 (see box: Solitary effort). PTL sold about 500 tractors. But the market was dominated by medium and heavy tractors. "While our original mandate was for a 20 hp tractor, this wasn't viable in itself. So, we had to go in for 30 hp or above models, which commanded much higher prices," says Chandra Mohan, former chairman and managing director of PTL. Thus ended India's sole experiment with a small indigenous tractor. The company, however, did very well and emerged as one of the biggest tractor manufacturers with almost 20 per cent market share. Power tillers were also introduced in India in the 1960s. Of 8-13 hp range, they suited small farms. Initially, there were seven power tiller companies in India, but two apart, all closed down because of low demand from farmers: at Rs 1.3 lakh and upwards, farmers found them prohibitively expensive. Besides, tillers lacked versatility. After all, the tractor can also transport farm produce. Or, people. India could take a lesson or two from China, which too, began by importing tractors in the 1950s from European countries. But by the 1970s, it developed affordable, indigenous small tractors ideal for the majority of its farmers. This coincided with the Communist nation's redistribution of farmland among peasants: small holdings; less family labour to plow. The Chinese chose to innovate. Their tractors employ a single cylinder, horizontal engines easy and cheap to maintain. The transmission mechanism was simplified so that V belts could be used (belts used for power transmission; they run in a pulley whose groove is V-shaped). This enabled the engine to also operate pumps and electrical generators. 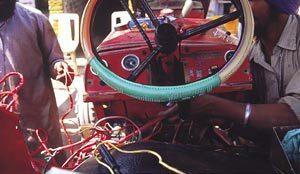 The use of V belts also reduced the number of components required in the tractors. It also reduced cost, something Indian tractor makers haven't done. For, they never innovated. In China, the 15-24 hp tractors proved highly efficient, especially for rice cultivation. About three million were produced in 2000. Catering to a real demand. What happens in China is, truly, the reverse of what happens in India: in 1996 in China, almost 2 million small tractors were sold. Can this happen in India? Indian tractor manufacturers say the demand for small tractors in the country is low. Therefore, they find, developing low horsepower engines are unvaible. What they do -- it is a travesty of industrial research -- is merely de-rate powerful engines for small tractors, so-called. 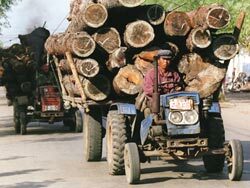 Naturally, the cost of small tractors (including maintenance) as compared to medium horsepower tractors cannot reduce. Naturally, farmers consider them poor value for money and never pick it up. Amazingly, in a country where the majority of farmers are small farmers, developing an indigenous small tractor has never been a priority with Indian policy makers. "As far as I know, there is no serious research effort in the country to develop a low-cost tractor," says Srivastava. To promote small tractors (so-called), government introduced in 1993 a subsidy of Rs 30,000 or 30 per cent of the price (whichever was lower) on tractors below 25 hp. Only a minuscule number were picked up. Buyers were usually rich farmers, using such tractors to spray orchards. "Several manufacturers like Swaraj and Ford introduced low horsepower tractors, but they failed to become popular, even with the subsidy," adds Srivastava. Some experts argue tractors in India are cheap. They say the price of an Indian tractor is roughly one-fourth of that available internationally. But prices alone do not reflect ground reality: for instance, says E V Thomas, professor of agriculture engineering at the Indian Institute of Technology, Kharagpur, the cost of a power tiller in Japan is comparable to the price of 3 tonnes of rice. In India, a farmer has to sell at least 25 tonnes of rice to buy the same equipment. So how should small farmers cope? They have always depended upon draught animals. Can they meet the increasing demand of foodgrains with their yoked animals? This, after four decades of government efforts to promote farm mechanisation through tractors. Can tractors -- small tractors, whenever they will be built -- completely replace draught animals? Small and marginal farmers comprise over 80 per cent of cultivators in India. They can't afford tractors. Average farm size, too, is becoming smaller due to fragmentation. Also, there exist large tracts of low tractor density. Besides, difficult terrain in several regions (say, hilly areas) prevents tractor use. So, exactly how viable is the small tractor for such farmers? A single fact could clinch this argument. Draught animal population in India has been steadily declining (see table below: Just about pulling). Government has poorly invested in research on draught animals. The only time a concerted effort occurred was in the mid-1980s, propelled by sizeable funding -- from foreign and multilateral sources, alarmed at the African food crisis (the absence of draught animals in sub-Saharan Africa meant that ploughs were pulled by humans). India has always had the best draught animals. The research funds came to institutions affiliated to the Indian Council for Agricultural Research. By the late 1980s, research papers were generated highlighting the most critical issues in the draught animals sector. This was also the time when the value of draft animals to India's economy was calculated and understood (see box: Animal assets). In 1987, a national seminar was held on draught animal power at the Central Institute of Agricultural Engineering (CIAE), Bhopal. Since then interest, more importantly action, in this area has waned. *Camels are mainly used in Rajasthan & Haryana for field operation and thus, 60% of its total camel population assumed for field operations. Among leading researchers on draught animal power were N S L Srivastava and T P Ojha, both former directors of CIAE, and N S Ramaswamy, former director of the Indian Institute of Management, Bangalore. "Draught animals and tractors are complementary sources of power on Indian farms and will continue like that for many more years to meet the increased demand of power, of increased production and productivity," says a 1987 paper Ojha wrote, analysing draught animal power and tractors. It points out that a 35 hp tractor can prepare the seed-bed and sow 0.2 hectare (ha) in one hour at Rs 270-300 per ha. Bullocks need an entire day for the same area, at Rs 300 per ha. The problem is that draught animals have to be fed throughout the year, though their optimal use is restricted to three months in the year, Srivastava told Down To Earth. The viability of draught animals depends on the availability of free fodder, through crop residues or from grasses in village pastures. The mid-1980s also saw the most comprehensive study of the destruction of village pastures, by N S Jodha of the International Centre for Integrated Mountain Development, Kathmandu. But the most serious challenge, it emerged, was the destruction of valuable breeds. India has the world's best draught animals, particularly cattle (see 'India carriers Inc', Down To Earth, June 15, 2000). They were promoted in pre-Independence India by princely states and temple trusts, which provided funds to develop specialised breeds as well as stud bulls for breed improvement in villages. Of India's 27 known cattle breeds, most were developed for draught in times the economy ran on animal power. Milk production wasn't the focus of cattle breeding, then. With the Green Revolution, it was assumed tractors would make draught animals irrelevant. Government support for breed maintenance died out. Provisional figures for the 2003 Livestock Census show indigenous cattle have decreased by 13 per cent from 1992. Crossbred cattle have increased by 46 per cent. So much so, most indigenous cattle -- 80-90 per cent -- is now categorised as 'non-descript'. With the White Revolution -- milch cattle were its backbone -- the breeding emphasis changed. Breeding programmes turned into crossbreeding with exotic cattle. Meant to improve 'non-descript' animals, it led to the genetic decimation of the best draught breeds (see 'Vanishing breeds', Down To Earth, September 15, 1997). CIAE continued to work on design improvements in carts and other animal-drawn agricultural implements. A designs it has been promoting is the Nagpuri yoke: it increases energy output from draught animals by more than six times, as compared to several local yokes used across the country; the harrow disc's size is smaller. Elsewhere, Ramaswamy founded the Centre for Action, Research & Technology for Man, Animal & Nature in Bangalore, which has been doing similar innovations with bullock cart design. But among the higher echelons of agricultural policy-making and research, draught animal power is considered a very lame duck. All the research and analysis of the 1980s should have led to a strategy for the draught animals sector. But it didn't. Part of the reason, says an official who was part of the research euphoria of the 1980s, was orientation. "It was driven by funding, not by felt needs. It was a golden opportunity to use money for a critically ignored sector. The research should have created a focus on fodder and genetic improvement," says the official, not wishing to be named. No. The fodder crisis has gotten worse. Fodder prices compete with prices of foodgrain in several parts of the country, rising further during drought. Work such as that of Jodha has become extinct; even the lessons haven't been learnt. Governments continue to redistribute pasturelands to landless farmers; its part of the short-term vision they possess. The research of the 1980s should have helped build a political consensus on livestock issues. Given the holy status of cattle among Hindu and Jain communities, this should have been imminent. But it hasn't. The most serious challenge today is the loss of the genetic base of draught animals, point out animal breeders. It is very easy to develop milch breeds, for the output is easy to calculate in terms of quality as well as quantity. Developing draught breeds is several times more difficult: the criteria for measuring are not very clear. Breeding experiments with draught animals probably don't exist anywhere in the world. And if breeding draught animals were a serious business, more than 90 per cent of bullocks with proven draught ability would be found castrated, to make them easy to handle. One way to maintain the draught breeds would have been to tap into foreign markets. After all, didn't the research funding come as a result of the African farm power crisis? But India hasn't exported draught animals to Africa; it hasn't developed any market for draught breeds at all, with or without the support of development agencies. Brazilian breeders can often be sighted in Indian cattle fairs, selecting animals of fast-growing breeds that possess resistance to diseases; does the government know this? Is it prepared to respond to such interest, via a full-blown strategy? In fact, one of India's leading business houses with expertise in cattle breeding has been seeking a license to export embryos of the Ongole, the largest cattle breed in the world, native to Ongole in Andhra Pradesh. But the Union ministry of agriculture's department of animal husbandry and dairying has steadily refused. The department has a breed conservation plan of its own, which is ineffective. On top of that, it prevents efforts to profit from draught breed conservation. The losers, utlimately, are small farmers. Government notwithstanding, the potential of draught animal power remains. Can it be realised? Yes, via a concerted effort to maintain breeds. And, soundly managing common pastures: this is possible if development funds of local self governments are tied to the state of its commons. Collective action only comes through collective pressure. Small and marginal farmers constitute about 80 per cent of India's farming community. It would be logical to think that any government policies aimed at the country's farmers would, first and foremost, benefit them. But reality does not bear this out; rather it shows that these farmers remain the most neglected. Take the case of tractors. Only the rich farmers have benefited from tractors because they are expensive. The need for a small tractor was realised 40 years ago. But the need to act on this realisation is yet to be understood. Since the fruits of farm mechanisation haven't reached the small farmers, they remain dependent on draught animals. The country has 65 million draught animals. But research into improving breeds or yokes and other equipment has been poor. And who gets impacted? Again, the small farmer. But time is running out -- our numbers are increasing, our food demands are increasing, but the arable land cannot. The rich farmers already might be maximising their yields. The growth in food production now has to come from the small and medium farmers. For this, both tractors and draught animals are equally important. The problem is the policy that allows the market to rule. Compounded with this is the mindset which simply blocks out what is not big and obvious. There is no place for the small tractor of the bullock in the Indian policy fields.